Oscar Wilde's story - his rise and fall - remains fascinating. His plays were the toast of London and his 1895 masterwork The Importance of Being Earnest, was being staged at the time of his scandalous trial. His is now a familiar story. Bosie Douglas, Wilde's young lover, bullied him into bringing a libel suit against his loathsome father, the Marquess of Queensberry, who accused him of being a "sodomite." When it became clear that various rent boys would support the claim, Wilde dropped his suit. He was then charged with "gross indecency," and, with the threat of jail imminent, given time to flee England. Wilde holes up at the Cadogan Hotel as his friend Robbie Ross (Cal MacAninch) begs him to leave. Bosie (Charlie Rowe), still pushing his own agenda, wants him to stay and fight. Wilde, known to be pompous and arrogant, is, in David Hare's The Judas Kiss, now at BAM's Harvey Theater, a kinder, gentler Oscar: still witty and clever, but more reflective and melancholy. Noting how many young men are en route France in the wake of the scandal, Wilde muses: "Opera will be stone dead." Wilde is played to perfection by Rupert Everett, who channels the legendary writer at every turn -- his wit, charm, exasperating ways and inexplicable Bosie obsession. His sharp, rueful performance alone is worth the price of admission. The play is Hare's thoughtful meditation on why Wilde chose to stay, since his inaction will lead to ruin. By act two, a shattered, broke Wilde is in Naples, inexplicably reunited with the ever-demanding, delusional Bosie, busy flaunting his boy toy. Hare tries to reconcile Wilde's public and private selves, to determine why he participates in his own downfall. (Wilde did not martyr himself for homosexuality at his trials, but stood for personal privacy.) The conniving Bosie, beset by daddy issues, is perceived as indifferent to Wilde's fate. His concerns, first, and foremost, are for himself. How did such a clever man, gifted at peeling the artifice from the aristocracy, allow himself to be used in such a spectacularly horrible fashion? The Judas Kiss, which enjoyed a successful run at the Hampstead Theater in London, isn't so much a dramatic effort as a compelling examination into the complexities and contradictions of Wilde. The tension in act one is intense, thanks to Neil Armfield's tight direction, but ultimately, it is more about the inexplicable decisions that altered his life. 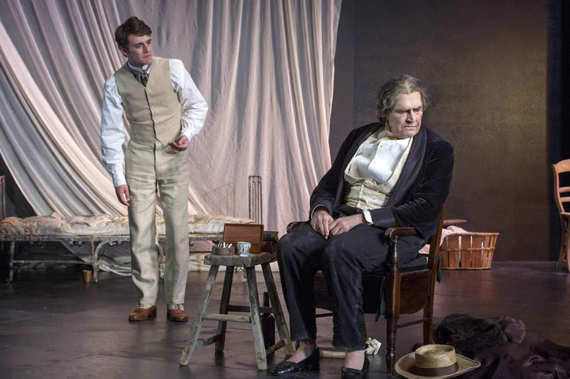 The play showcases the wonder of Wilde -- and mourns the loss of his considerable talent. The instinct for self-preservation -- if not for himself and his genius, then his children -- is appallingly MIA. And always, there is the scheming, self-involved Bosie. Rowe is well cast; he captures Bosie's manipulative ways, as well as his hair-trigger temper, with precision. It's been 116 years since the great playwright's death -- yet Hare's The Judas Kiss reminds us that the ill-fated alliance proved Wilde right: "Each man kills the thing he loves." In Wilde's case, it's himself.